It’s 9pm, pitch black, and it’s bouncing down just now — a proper tropical downpour. Apart from a few drops once in January, this is the first time it’s rained since I arrived over 2 months ago. Not only is it throwing it down, but the electricity went off around 7.30 so the streets are really dark, other than the car headlights, and a bit of light coming from houses with backup power. I myself am running on my UPS just now… it has a big lead-acid battery, about twice the size of a typical car battery, and I was told it will last 8 hours, but we’ll see. Power-cuts are commonplace here, but the longest I’ve seen so far has been an hour. The rain will be a relief to my plants. Just yesterday I visited a real, live garden centre and bought some plants, seeds and pots so I can get started on establishing a garden or two in my outside space. I’ve also been out stalking the neighbourghood after dark with a bag and a pair of scissors, to see what I can collect in the way of cuttings. I have a lot of space to use, so I’m keen to establish as much as I can really quickly. I feel typically British for even mentioning the weather! But of course back in the UK the weather is unpredictable, coming off the Atlantic ocean, and so it’s the ideal daily topic for chat. I found it quite strange to have very uniform weather here in Bangalore — up until about 3 days ago it’s been around 30 degrees and sunny all day every day, except for the occasional morning mist which anyway burned off quite quickly. We have another 3 months before the monsoon arrives, so I’m curious to see what the weather’s like between now and then. One thing’s for certain — the seasons I’ve known all my life don’t exist here. “Officially”, the seasons are as follows, although in a country the size of India there’s a wide range of different climates. Given that I’m planting seeds just now and taking cuttings, I find it quite difficult to know whether the timing is right or not. But it’s February and to me it feels like the right time to be starting things off. Hah, yeah – Guerrilla activity would have a whole extra edge to it in Singapore, eh? 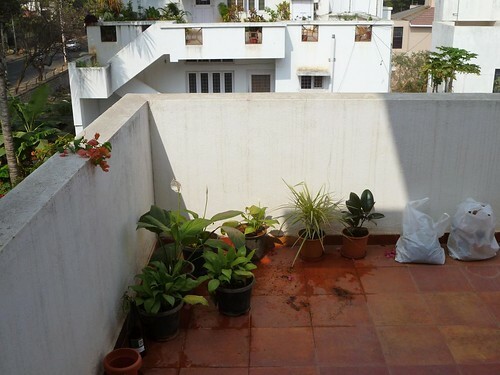 Hi Chris, welcome to Bangalore and to gardening here. I’ll be following your blog to see how you’re getting on. It would help if you could add an RSS feed through feedburner.com. The forum on geekgardner should be a big help to you; it has been to me. I’m doing some balcony gardening right now while I work on getting a house with a proper garden. Hi Jeanne, thanks for the message and for the Khamba feedback on geekgardener! The moongdaal.in domain was a last-minute impulse buy and the blog’s not fully set up at that address just yet. I went shopping at the Lalbagh today… wow! I was wishing I could’ve taken a truck up there, rather than bringing stuff home in an auto. I’m sure you know what I mean! Absolutely. Sometimes I think we Bangalore gardeners should hire a van and make a collective trip to Lalbagh to get the most out of the place.